The building was built for $8,000 in 1892 by W.O. 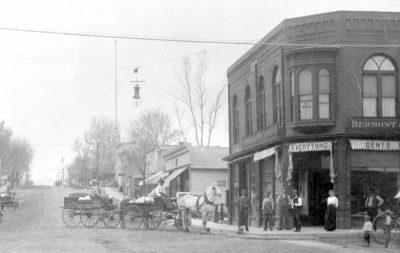 Van Etten for George B. Cannon, but was purchased by Abner C. Goodhue in 1893 and housed the Cannon & Bermont general store followed by the George E. Bermont Dry Goods and Groceries store. W.D. Cannon, brother of George Cannon and James Cannon Jr., was Bermont’s early partner. Goodhue initiated a lawsuit against Northern Coal and Coke Company, owner of the Simpson mine, in 1903. Goodhue claimed that undermining had caused the damage. He asked for damages of $19,000. Photos taken for the jury trial in 1903 by Boulder photographer J.B. Sturtevant show the second story on the south side of the brick building leaning a few degrees toward the street. In December 1903, a Boulder jury agreed with the subsidence claim and awarded Goodhue $3,650. The (leaning) second floor of the A.C. Goodhue building was not removed until the 1940s. The building later housed a grocery store and was torn down about 1999. 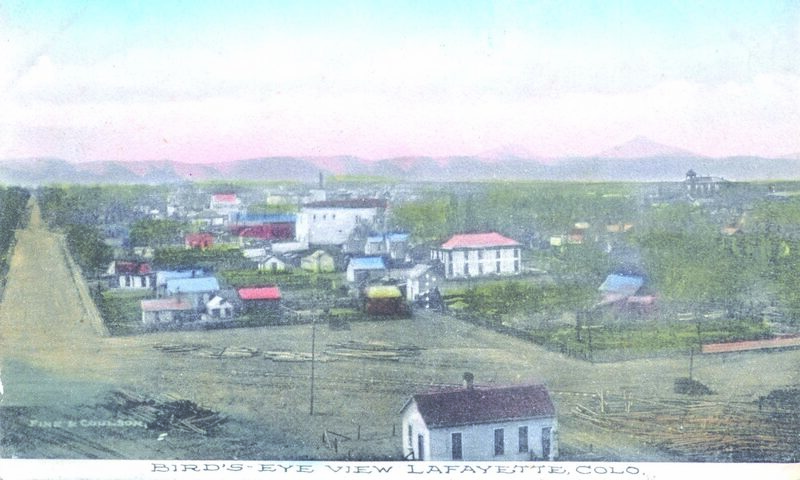 Sources: Lafayette News, 1902 and 1903; Daily Camera, Sept. 1, 1892; “Reference List of Buildings in Lafayette, Colorado” by Anne Cramer, 1980 (updated and kept current by the Lafayette Historical Society).